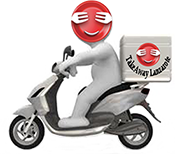 ***Delivery Fee for this Takeaway 3.50€ . Takeaway Lanzarote - Restaurants Playa Blanca Pita Bread Bread ,beef ,salad and sauce. Takeaway Lanzarote - Restaurants Playa Blanca Beef Kebab Wrap Bread ,beef ,salad and sauce. Takeaway Lanzarote - Restaurants Playa Blanca Beef Kebab Menu with chips, drink. Bread ,beef ,salad and sauce. Takeaway Lanzarote - Restaurants Playa Blanca Pita Bread Bread ,beef and chicken ,salad and sauce. Takeaway Lanzarote - Restaurants Playa Blanca Mixed Kebab Menu with chips and drink. Bread ,beef and chicken ,salad and sauce.